UV-reactive O-rings: Another element to make your system truly unique! O-rings are just used to ensure a tight seal? That was yesterday! With the Phobya O-rings a truly unique element can be installed with very little effort. Exchange the boring standard gaskets and upgrade your watercooling system even further. The diversity of available colours (blue, green, orange, purple, red and white) will allow you to find the perfect gasket for your system! Would we have made these O-rings 1.6mm thick as it is common on 1/4" threads with a groove it would disappear in the groove and be invisible. As we have designed these O-rings to be special modding effect they are a little thicker. A tight seal is still 100% ensured! 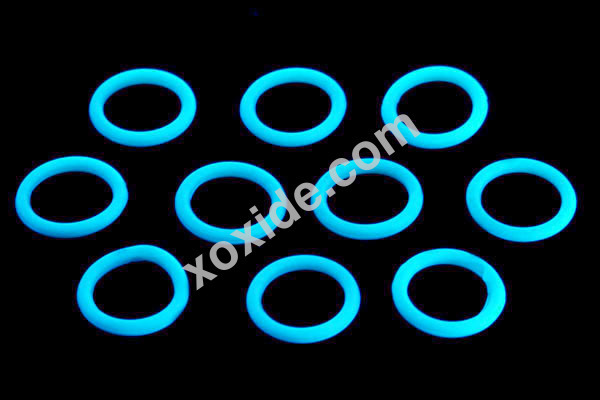 The O-rings just get pushed out a little to the side and are nicely visible under UV light.